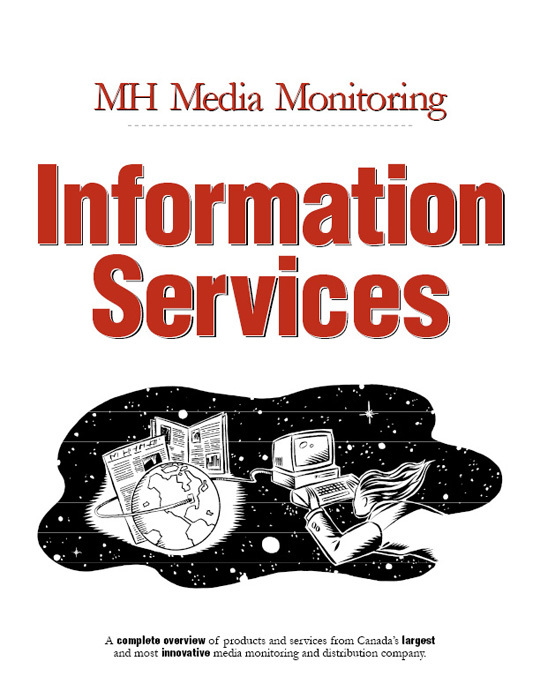 A pision of Maclean Hunter, (now Rogers) MH Media Monitoring was the largest media monitoring and distribution service in Canada. Sometimes it is obvious that companies could use some help, and you know that no matter what you do you can improve their image substantially. This is one project that I relished because I knew that I could help them, fit within their budget and improve their image. To extend the reach of their new electronic monitoring service on a photocopying budget. Several direct mail campaigns were designed at a very low cost. Most of the pieces were fold-out, accordian-style brochures. For the first time humour was used to announce what would otherwise have been fairly dry information. This entry was posted on 2008.12.31 at 9.48 am and is filed under Service. You can follow any responses to this entry through the RSS 2.0 feed. You can leave a response, or trackback from your own site.